Etihad Airways is a flag carrier and the second-largest airline of the UAE (after Emirates). Its head office is in Khalifa City, Abu Dhabi, near Abu Dhabi International Airport. Etihad commenced operations in November 2003. The airline operates more than 1,000 flights per week to over 120 passenger and cargo destinations in the Middle East, Africa, Europe, Asia, Australia and the Americas, with a fleet of 126 Airbus and Boeing aircraft as of July 2017. In 2015, Etihad carried 14.8 million passengers, a 22.3% increase from the previous year, delivering revenues of US$9.02 billion and net profits of US$103 million. Its main base is Abu Dhabi International Airport. 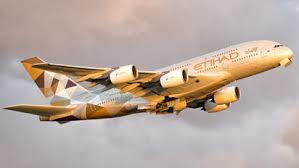 In addition to its core activity of passenger transportation, Etihad also operates Etihad Holidays and Etihad Cargo.Etihad established its own airline alliance, Etihad Airways Partners, in 2015, that includes Alitalia, Jet Airways, Niki, Air Serbia and Air Seychelles. With the exception of Niki, Etihad Airways holds minority equity investments in the participating airlines; as well as holding a stake in Virgin Australia, which is not officially listed as an Etihad Airways Partner. Booking for these airlines is consolidated under one network.